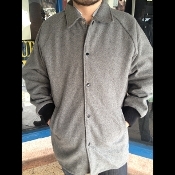 This coat is American Made, using gray wool melton coat with a black nylon lining. It has an inside chest pocket and 2 hand warmer pockets, all pockets are wool melton lined It has a wool melton collar using the same material as the body, with black knit cuffs. It has been called a finger tip coat, or a stadium coat as well. Greenspan's has been carry this model for over 50 years.